The ZOOM Geocoder is a web-based tool that is designed for geocoding of hard-to-find addresses and also auditing of other processes to make sure they are producing correct results. The ZOOM Geocoder utilizes the Internet's best and most up-to-date geocoders and mapping programs available. If these automated geocoders can't find an address, no automated tool can. It then consolidates the results from all of the geocoders and shows them on a RATA-enhanced Google map. By analyzing the results displayed, the user can compare all of the results on one page and select the correct Tract quickly and easily. Easily type the address you would like to look up. You may also paste the complete address from another source and ZOOM will parse the fields for you. The submitted address is then geocoded by several different sources and visually display each one based on the exact coordinates returned. Click on individiual locations to view advanced Geocode and Demographic information. You may also print the details along with a custom map. 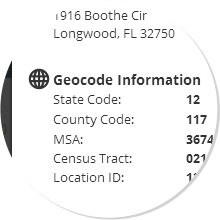 For compliance purposes, geocoding is the process of assigning the correct MSA, State Code, County Code and Census Tract to a physical street address. 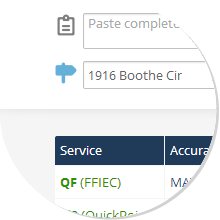 This type of geocoding is typically used for HMDA, CRA and Fair Lending, but the Latitude and Longitude returned from geocoding can also be beneficial for other business purposes. With geocoding, there are addresses that are easy to translate and then there are the trouble cases. Some of the factors that make an address hard to geocode include misspellings, wrong information, new areas, or very rural areas just to name a few. These examples could lead to what is known in the industry as "no-hits". Until now, if you had a no-hit you had to fall back to the smallest part of the address that could be found and pick that Census Tract or Lat/Long. Depending on if you fall back to a Zip+2, a ZIP Code, a City or even a County in extreme examples, the odds of the Census Tract being correct go down respectively. Now with the availability of the ZOOM Geocoder, no-hits and fallback geocoding can be improved in most cases to solid hits on the exact street. 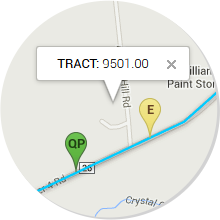 Not only can they be done, but they can also be visually verified to be 100% accurate by the person geocoding. The ZOOM Geocoder is the future of geocoding and auditing geocodes! Quickly and easily look up the submitted address against multiple 3rd party online sources and search engines. This is useful when trying to find out additional information about the property. Try ZOOM Geocoder today for free!